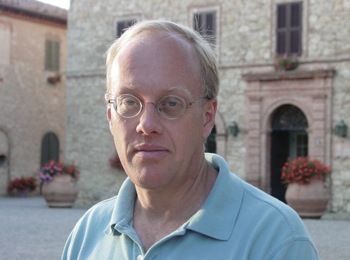 Chris Hedges made these remarks Saturday at a panel discussion in New York City titled "The Climate Crisis: Which Way Out?" The other panelists were Bill McKibben, Naomi Klein, Kshama Sawant and Sen. Bernie Sanders. The event, moderated by Brian Lehrer, occurred on the eve of the People's Climate March in New York City. For a video of some of what the panelists said, click here. We have undergone a transformation during the last few decades -- what John Ralston Saul calls a corporate coup d'etat in slow motion. We are no longer a capitalist democracy endowed with a functioning liberal class that once made piecemeal and incremental reform possible. Liberals in the old Democratic Party such as the senators Gaylord Nelson, Birch Bayh and George McGovern -- who worked with Ralph Nader to make the Clean Air Act, the Clean Water Act, the Mine Safety and Health Act, the Freedom of Information Act and the OSHA law, who made common cause with labor unions to protect workers, who stood up to the arms industry and a bloated military -- no longer exist within the Democratic Party, as Nader has been lamenting for several years. They were pushed out as corporate donors began to transform the political landscape with the election of Ronald Reagan. And this is why the Democrats have not, as Bill Curry points out, enacted any major social or economic reforms since the historic environmental laws of the early '70s. We are governed, rather, by a species of corporate totalitarianism, or what the political philosopher Sheldon Wolin describes as "inverted totalitarianism." By this, Wolin means a system where corporate power, while it purports to pay fealty to electoral politics, the Constitution, the three branches of government and a free press, along with the iconography and language of American patriotism, has in fact seized all the important levers of power to render the citizen impotent. The old liberal class, the safety valve that addressed grievances and injustices in times of economic or political distress, has been neutered. There are self-identified liberals, including Barack Obama, who continue to speak in the old language of liberalism but serve corporate power. This has been true since the Clinton administration. Bill Clinton found that by doing corporate bidding he could get corporate money -- thus NAFTA, the destruction of our welfare system, the explosion of mass incarceration under the  omnibus bill, the deregulation of the FCC, turning the airwaves over to a half dozen corporations, and the revoking of FDR's 1933 Glass-Steagall reform that had protected our banking system from speculators. Clinton, in exchange for corporate money, transformed the Democratic Party into the Republican Party. This was diabolically brilliant. It forced the Republican Party to shift so far to the right it became insane. By the time Clinton was done, the rhetoric of self-professed liberals was a public relations game. This is why there is continuity from the Bush administration to the Obama administration. Obama's election did nothing to halt the expanding assault on civil liberties -- in fact Obama's assault has been worse -- the Bush bailouts of big banks, the endless imperial wars, the failure to regulate Wall Street, the hiring of corporate lobbyists to write legislation and serve in top government positions, the explosion of drilling and fracking, the security and surveillance state as well as the persecution of government whistle-blowers. This audience is well aware of the Democratic Party's squalid record on the environment, laid out in detail in a new Greenpeace report written by Charlie Cray and Peter Montague, titled "The Kingpins of Carbon and Their War on Democracy." The report chronicles what it calls "a multi-decade war on democracy by the kingpins of carbon -- the coal, the oil, and gas industries allied with a handful of self-interested libertarian billionaires." The Obama administration, in return for financial support from these kingpins of carbon, has cynically undermined international climate treaties, a fact we discovered only because of the revelations provided by Edward Snowden and WikiLeaks. It uses its intelligence agencies, these revelations revealed, to spy on those carrying out climate negotiations to thwart caps on carbon emissions and push through useless, nonbinding agreements. The Obama administration has overseen a massive expansion of fracking. It is pushing through a series of trade agreements such as the TPP and the TAFTA that will increase fracking along with expanding our exports of coal, oil and gas. It authorized the excavation of tar sands in Utah and Alabama. It approved the southern half of the Keystone pipeline. It has permitted seismic testing for offshore drilling in the Gulf of Mexico, the East Coast and in parts of Alaska, a process that kills off hundreds of sea mammals. It authorized drilling within four miles of the Florida coastline, violating one of Obama's 2008 campaign promises. This expansion of offshore drilling reversed 20 years of federal policy. The Democratic Party speaks to us "rationally." The party says it seeks to protect civil liberties, regulate Wall Street, is concerned about the plight of the working class and wants to institute reforms to address climate change. But in all these areas, and many more, it has, like its Republican counterpart, repeatedly sold out the citizenry for corporate power and corporate profits -- in much the same manner that Big Green environmental groups such as the Climate Group and the Environmental Defense Fund have sold out the environmental movement. If Wolin is right, and I believe he is, then when we begin to build mass movements that carry out repeated acts of civil disobedience, as I think everyone on this panel believes we must do, the corporate state, including the Democratic Party, will react the way all calcified states react. It will use the security and surveillance apparatus, militarized police forces -- and, under Section 1021 of the National Defense Authorization Act, the military itself -- to shut down all dissent with force. The legal and organizational mechanisms are now in place to, with the flip of a switch, put the nation effectively under martial law. When acts of mass civil disobedience begin on Monday morning with Flood Wall Street and later with Occupy the U.N., the face of the corporate state will, as it did during the Occupy movement, reveal itself. If the response of the corporate state is repression rather than reform, then our strategy and our tactics must be different. We will have to cease our appealing to the system. We will have to view the state, including the Democratic Party, as antagonistic to genuine reform. We will have to speak in the language of ... revolution. We will have to carry out acts of civil disobedience that seek to cripple the mechanisms of corporate power. The corporate elites, blinded by their lust for profit and foolish enough to believe they can protect themselves from climate change, will not veer from our path towards ecocide unless they are forced from power. And this means the beginning of a titanic clash between our corporate masters and ourselves.